Poppy, the third volume in the series Medicinal and Aromatic Plants - Industrial Profiles presents up-to-date information on Poppy and related species. The introduction emphasizes the importance of Poppy, giving a historical evaluation. in the chapters describing the botany and taxonomy of the genus some novel aspects are discussed, e.g., special morphological, structural differentiation. The chapters concerning the physiology and cultivation of Poppy and alternative raw materials give a detailed presentation of this complex issue. Beyond the detailed analysis of ecological factors affecting the accumulation of opiates, both the basic methods of illicit and licit cultivation are discussed. 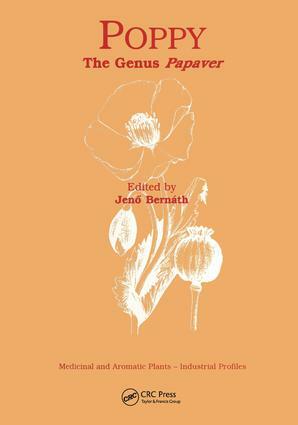 in this volume, for the first time, an evaluation of the Australian Poppy production is presented. Also discussed are the pharmalogical effectiveness and application of opiates, as well as the international control of their processing and trade, and the modern approach to compiling both the chemical and biotechnological information concerning poppy.